Geophysical measurements yield data of layer thicknesses of aquifers and of the their boundaries. 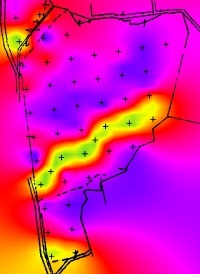 Depth and location of groundwater can be determined. 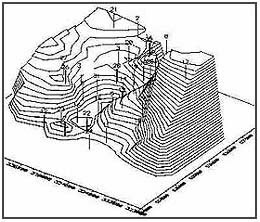 Morphology of a layer boundary gravel-clay within an area of several square kilometers, a revealed from resistivity depth sounding. The 3D-block diagram shows a pronounced channel system. Geoelectric localization of a sand channel (green-yellow for high resistivities) within clays. Layer modeling further determined the 3-dimensional geometry. Former meander channel filled up with fine sediments. 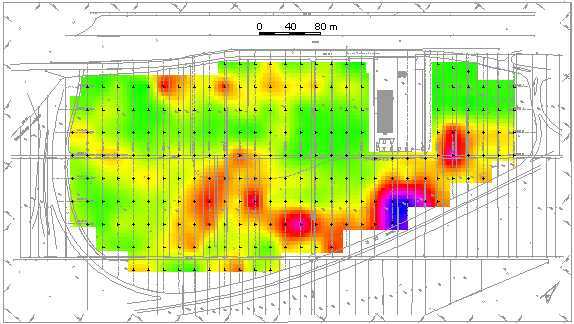 212 resistivity depth soundings. Prospection of ground water in Chile with resistivity depth soundings.